It’s International Rabbit Day! This weekend is dedicated to promoting the well-being of rabbits everywhere- from pet rabbits, to wild rabbits, to lab rabbits, and more. Make sure you are providing a safe, healthy, enriching indoor home for your pet rabbit. Take a look at our Rabbit Care and Rabbit Behavior sections for information about proper diet, indoor housing, bunny proofing, enrichment, and more. Our article, How to Care for a Pet Rabbit, provides a basic overview. Share the article with other rabbit owners! Boycott and/or peacefully protest companies and organizations whose practices exploit rabbits (from product testing, to selling rabbit meat, to fur-farming, to conducting rabbit rodeos/scrambles, etc.). Support cruelty-free companies. Look for the Leaping Bunny logo on products. You can do a product search here. What will you do to celebrate International Rabbit Day? After the rabbits’ move from upstairs to downstairs, Cosette has determined that my office is her favorite room. 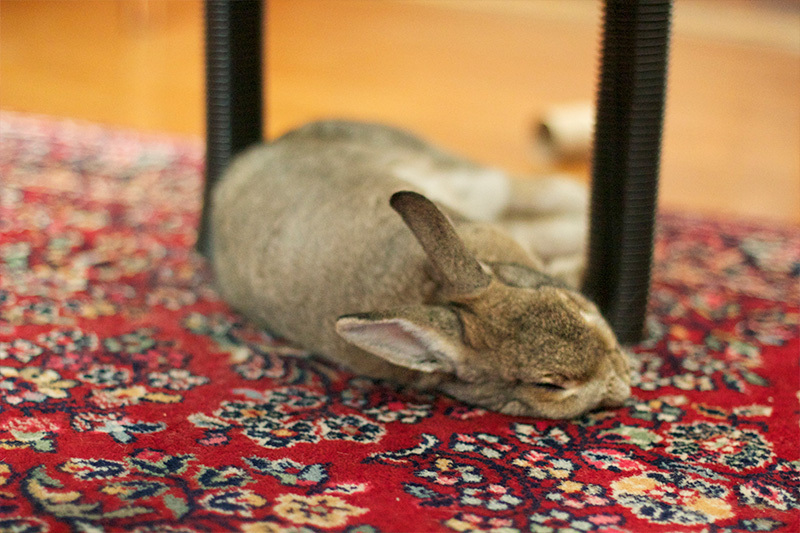 Accepting that Cos was going to be a regular in this room, we took steps to bunny proof it properly. The flex tubing on the wooden coffee table legs, although unsightly, has been quite effective at protecting them. We recently published a new article called Logic Toys for Rabbits. The article was written by Christina Chivers of the online store, Bunny Approved. Of course, if you don’t feel like making the toys yourself, you can purchase them from Bunny Approved. In preparation for a newcomer into our household (a baby in September! ), we decided to do some rearranging of rooms. Coco and Cosette, who used to live upstairs, were moved downstairs, along with my office. So now they primarily live in the kitchen / hallway, with supervised access to my office. Coco in his new favorite spot under the kitchen table. 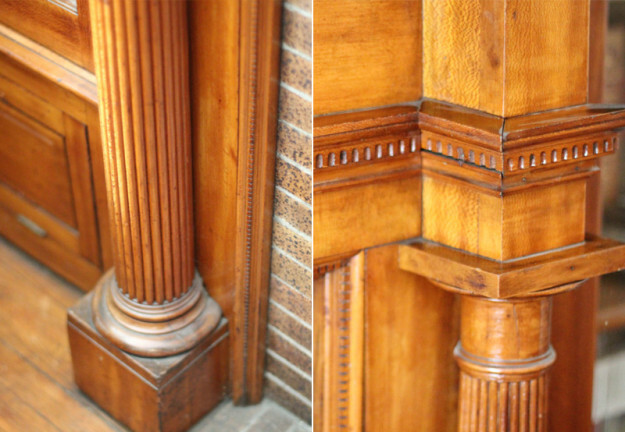 The house is an old Victorian with beautiful, intricate woodwork in the downstairs. It provides a multitude of wooden corners and edges that would be a rabbit’s dream to destroy. Examples of the Victorian woodwork. As we discussed in our Bunny Proofing article, baseboards will get destroyed if not protected. When Coco and Cosette lived upstairs, we mainly blocked off the baseboards with furniture and tunnels, and we also just let them go a bit. Periodically, we would sand them down and repaint them, as the upstairs baseboards were just 2x4s, not like the historic, intricate moldings found downstairs. We liked this idea, but we were also looking for a solution that you could easily remove on a temporary basis (perhaps when having dinner guests, e.g.) and one that did not involve putting a lot of holes in the moldings. We brainstormed a few different ideas, including using zip-tied storage cube panels that would run along the walls and would be attached by a limited number of hooks by the doorways. 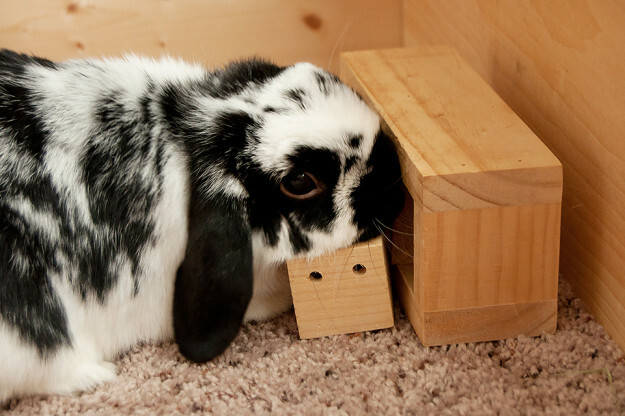 Furring strips zip-tied to the storage cube panels would provide a buffer between the fencing and moldings so that little rabbit mouths couldn’t reach the woodwork. This solution would allow us to remove the fencing (which would be unsightly) in a quick and easy way, and then put them back on as necessary. We used custom-sized wood panels (connected with hinges to accommodate all the different angles) attached to the moldings via Velcro strips. The panels were stained to blend in better with the rest of the woodwork. 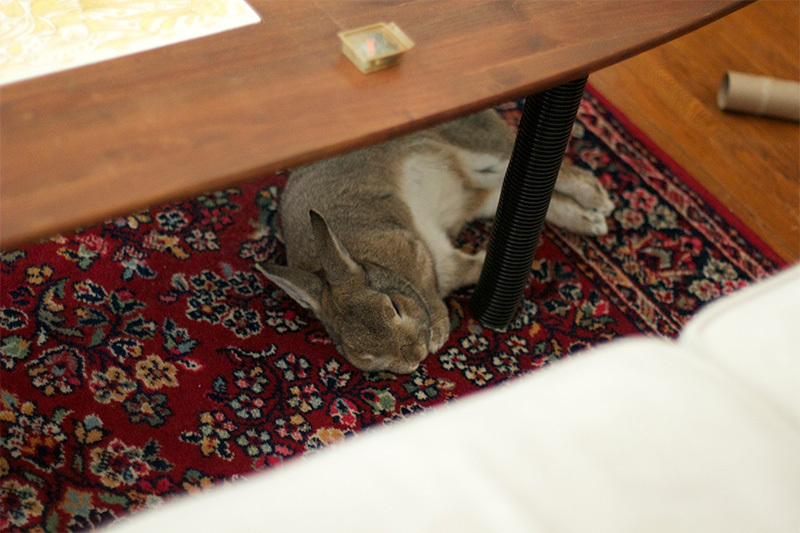 Because they’re held onto the baseboards with Velcro, they’re easily removable by us (but not the rabbits). It’s been two days and Coco and Cosette have already gone to work chewing the wood panels. No surprise there. But the baseboards themselves are protected from further damage. 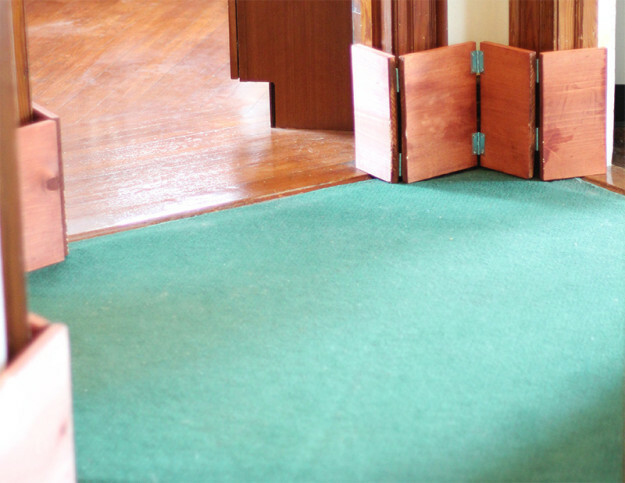 What solutions have you tried to protect your baseboards? Amy Sedaris with her rabbit Dusty. Comedian, actress, and house rabbit advocate Amy Sedaris recently gave an interview in Style Magazine. She spoke about her rabbit Dusty, who recently passed away at 12 years old, Tattletale, her first rabbit, as well as general tidbits about living with house rabbits. Here are some highlights. Read the full article at Style.com. 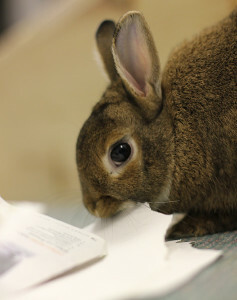 For the owners of rabbits with special needs, there’s a new resource to help guide them. 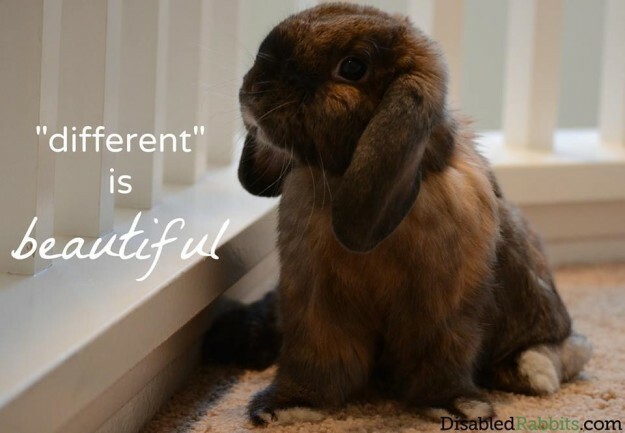 DisabledRabbits.com is a not-for-profit educational website dedicated to giving owners of disabled rabbits the resources, tools and guidance they need to provide their special needs buns with the best care possible. 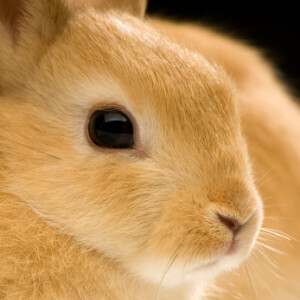 DisabledRabbits.com provides care tips for paralyzed rabbits, rabbits with head tilt, rabbits with splay leg, rabbits with arthritis, blind rabbits, deaf rabbits, elderly rabbits and rabbits suffering from other conditions that affect their physical health and mobility. Learn about pain management techniques, special housing setups, wheelchairs, hygiene, and more! Say No to Live Bunnies for Easter! As Easter draws near, it is important to spread the word that live rabbits should not be given as Easter gifts. While rabbits make excellent companions for some families, they have a unique set of needs that not everyone can meet. You will need to bunny-proof your home or else your rabbit will wreak havok. Rabbits need plenty of space to exercise. They are social, curious, and intelligent animals. But they also have an incessant urge to chew. Everything from wooden chair legs to electrical wires to remote control buttons to mouldings are fair game to rabbits. Rabbit owners will need to take the time to properly protect and stow away personal belongings. Rabbits need access to fresh hay at all times. If you have grass allergies, a rabbit probably isn’t for you. 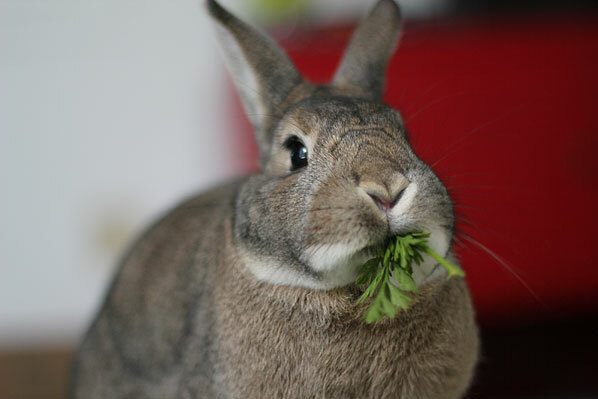 Hay provides the primary sustenance for a rabbits to maintain digestive and dental health. You can’t just give them pellets. Rabbits generally don’t like being held. Although rabbits can be affectionate, they’re not as “huggable” as people imagine. Children and adults alike may be disappointed when Bunnikins won’t sit contentedly in their arms or laps. 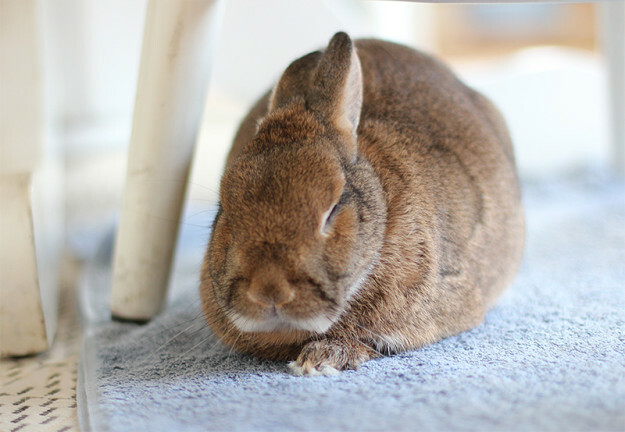 Most rabbits prefer to stay on the floor and have you sit on the floor with them (quietly). 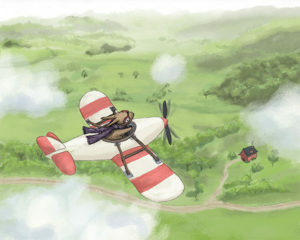 For more information, read our article, Easter and Rabbits. If you currently or have had a rabbit and are over 18 years old, you can fill out a survey called, “Exploring the experience of owning a pet rabbit.” The purpose of the survey is to gather information about rabbit ownership, rabbit-human relationships, and the challenges of ownership. The results will help develop educational materials for new rabbit owners and influence future research projects. The study is being conducted by Dr. Jason Coe, DVM, PhD and Ms. Tasha Welch from the Department of Population Medicine at the University of Guelph. 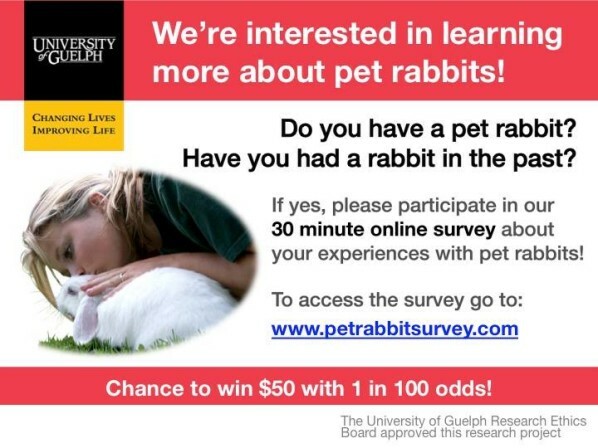 Take the survey at www.petrabbitsurvey.com.